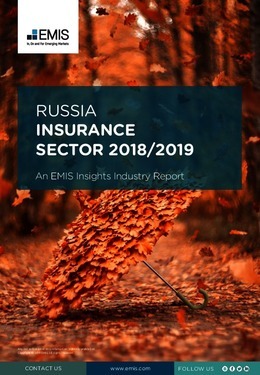 The large size of the Russian population offers strong growth opportunities to the insurance companies but the sector remains underdeveloped mainly because of the low income levels in the country and the limited awareness of the benefits of insurance products, especially of life covers. Insurance penetration rates in Russia remain low by global standards, with the overall premium income accounting for just 1.4% of the GDP in 2017, well below the world’s average of 6.13%. The gross value added of financial and insurance activities generated 3.8% of the country’s GDP in 2017. Non-life insurance is the dominant subsector, generating 75% of the total premiums in 2017. Still, the major growth driver in recent years has been the life insurance subsector. In 2017, a total of 194.1mn insurance contracts were signed, 80% of which were voluntary insurance contracts. This report provides a complete and detailed analysis of the insurance sector for Russia. EMIS Insights presents in-depth business intelligence in a standard format across countries and regions, providing a balanced mix between analysis and data. View key data on insurance premiums and claims in Russia. Gain an understanding of the regulatory environment for the sector in Russia. Build a clear picture of trends and issues for sub-sectors (life insurance, non-life insurance, reinsurance) and for retail channels.